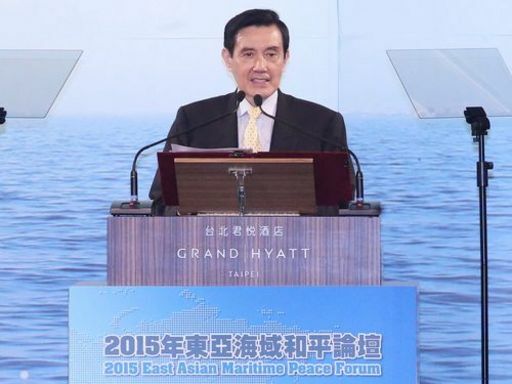 Taipei, Aug. 5 (CNA) President Ma Ying-jeou (馬英九) reiterated Wednesday that the Diaoyutai Islands are part of Republic of China territory, citing the perspectives of history, geography, geology and international law. Speaking at an international forum in Taipei, Ma noted that "some people" have remarked that the sovereignty is unclear, but said that "as president of the ROC, I will not accept this." "According to history," Ma said, the Chinese people were the first to discover and conduct activities on the islands, as recorded in a Chinese book dating back to 1403, he told the participants at the 2015 East Asian Maritime Peace Forum. In 1683, the Diaoyutais were included in the territory of the Qing dynasty, along with Taiwan, Ma went on. Many official books published between 1722 and 1872 mention the Diaoyutais, showing that the island group was under the rule of the Qing dynasty government, he added. Geographically, the Diaoyutais are located about 102 nautical miles north of Keelung City in northern Taiwan, and 230 nautical miles from Naha, the capital city of Japan's Okinawa Prefecture, Ma said in his address. Taiwan and the Diaoyutais also follow the same direction in the Kuroshio, a north-flowing ocean current on the west side of the North Pacific Ocean, he added. Meanwhile, the Diaoyutais and northern parts of Taiwan share similar geological patterns, he said, while stressing the connection between Taiwan and the island chain. From the perspective of international law, he continued, sovereignty over the Diaoyutais, along with Taiwan, was given to the ROC by Japan on Oct. 25, 1945, and this has been confirmed in the Treaty of Taipei, a peace treaty between Japan and the ROC signed in Taipei in 1952, he said. The treaty was signed after the ROC's victory in the Eight-Year War of Resistance against Japan in 1945, and since then, the ROC has been able to take the parts of its territory previously occupied by Japan. In December 1971, the ROC government put the Diaoyutais under the jurisdiction of the northeastern county of Yilan, Ma said. In 1997, then-President Lee Teng-hui (李登輝) added the 6.16 square kilometers of the Diaoyutais to the area of Yilan in an effort to assert the country's territorial claim to the island group, and he took another move in 1999 to defend the ROC's sovereignty over the uninhabited islands, Ma said. He made the remarks after Lee stated during a visit to Japan in July that the Diaoyutai Islands belong to Japan, not the ROC. The Diaoyutais have been under Japan's administrative control since 1972 but are also claimed by Taiwan and China.